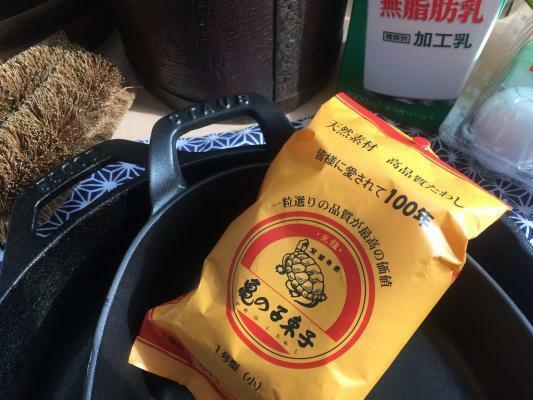 Home Cast iron cookware Tawashi, how well does the Japanese brush clean cast iron? 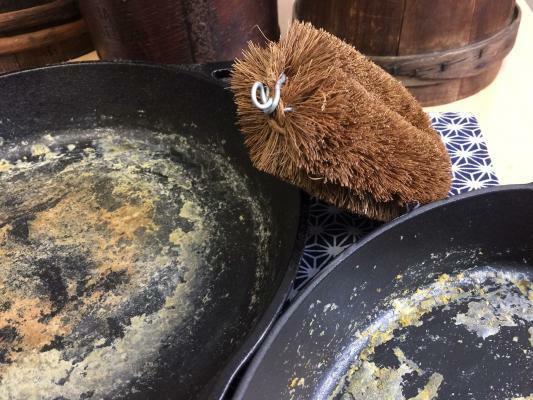 Cleaning cast iron cookware with a traditional Tawashi scrubbing brush. A Tawashi is a traditional scrubbing brush used in Japan. The brush is made from natural plant fiber it’s also a great little size and fits into your palm nicely. From cleaning wooden chopping boards, pots and pans wiping down the kitchen bench and also cleaning cast iron the scrubber does it all. Another use of the Tawashi is to scrub vegetables such as potatoes, carrots and gobo (burdock) which apparently the the little Japanese brush does very well. However when I heard it is traditionally used to clean cast iron it really my sparked up my interest. I went down to the local home centre and picked up a few to try out. My first thoughts the bristles would too hard and I wondered if it would do more harm than good. Tawashi brushes is widely used in Japan. Most Home Centers have their own in-house brand. So, how did the Japanese scrubber fair on my cast iron. 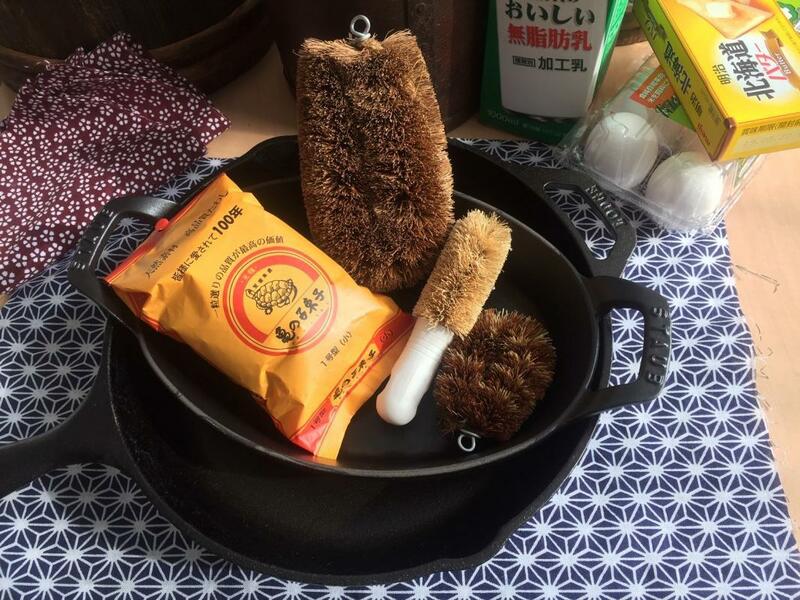 In this article you can learn about the Tawashi scrubbing brush and also see it tested on cast iron cookware. See the Japanese brush clean a seasoned skillet and an enameled dish. Find out the results of the test. Pros and cons of the Tawashi scrubber. Where can you buy one. The history of early Tawashi dates back hundreds of years. Although they were a little different back then. 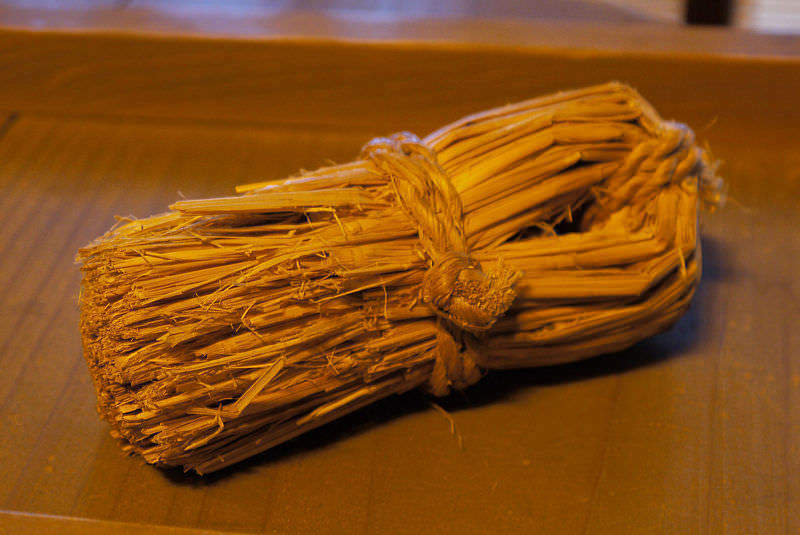 Japanese, used rice straw to make early versions of the brush. In the 20th century Tawashi brushes used alternative plant fibers such as the fiber from the windmill palm and the coconut tree. Importantly this fiber absorbed little water making it perfect for kitchen use. In 1907 a young businessman called Nishio Shouzaemon invented what is now the most famous Tawashi called Kamenoko Tawashi. Like many inventions it was a bit of an accident. Nishio tried his hand at making doormats made from coconut fiber. However his mats were not robust, the bristles flattened after a few uses making them useless to wipe away dirt. One day his wife used the material of one of these mats then used it as a scrubber. It seemed to work well and Nishio discovered that bending the fiber made stronger and water softened the bristles so it was suitable most surfaces without scratching. He was able cleverly attached the fiber to a wire so it could be shaped and wouldn’t come apart easily. Most likely learning from he’s previous attempt at making doormats and so Kamenoko Tawashi was born. The Kamenoko Tawashi is the most recognized brand of Japanese scrubber. It comes in an orange packaging with a cute little turtle on the front. Basically the scrubber translates into baby turtle sponge named after Nishio’s son’s pet turtle. 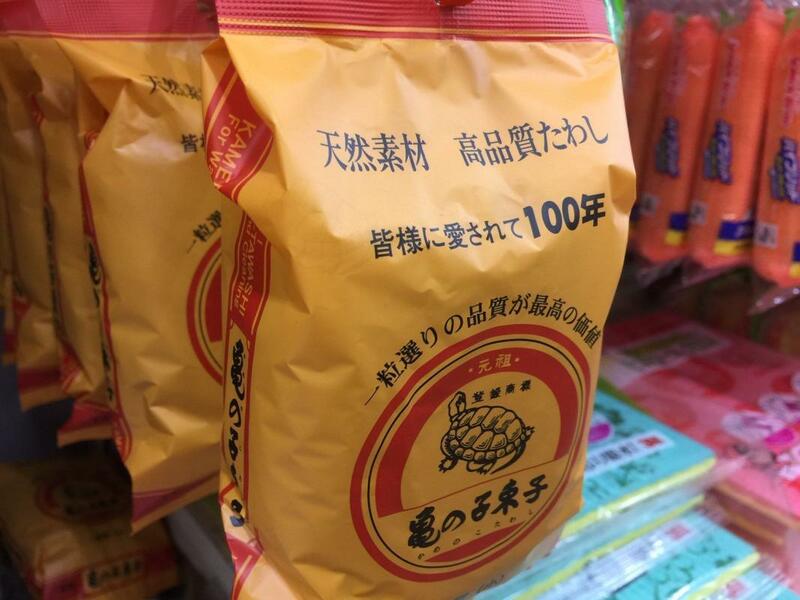 The Kamenoko brand has made Japanese scrubbers for over one hundred years. Kamenoko is a household name in Japan. The brushes are made really well so if you want to give one a try then look for the orange packet with the turtle on the front. In Japan the Tawashi is so ingrained into the culture that sponges that were made of different material were still called Tawashi. Here are some examples. Akuriru tawashi acrylicアクリルたわし is made from acrylic wool and is used for ceramics. Kameno Tawashi亀の子束子is the traditional tawashi made from palm fiber used for most cleaning dishing including cast iron. Kinzoku tawashi金属たわし Kin is gold in Japanese used to describe brass or stainless steel scrubbers. Suponji tawashi スポンジたわし standard sponge or Scotch Brite. Cleaning a cast iron skillet and an enameled dish using a Tawashi. Aim: To see if the how well the Japanese scrubbing would clean two types of cast iron cookware, bare and enameled cast iron. Is the Tawashi brush any good at cleaning cast iron? Cooked scrambled egg mix without any butter on a high heat. After burning the eggs I then scrapped out the eggs using a spatula leaving an awful mess. I filled up the pan with warn water and didn’t add any dishwashing liquid. After five minutes I scrubbed out the pan using the Tawashi. What a mess. I cooked the eggs without any butter or oil. Although I must admit I’m impressed with the Staub. The egg wants to flake off even before cleaning. This wasn’t supposed to happen. It was easy to use and the egg lifted with ease. I wipe the pan with a white towel to see how well it clean the pans. Also the see if it lifted the seasoning or scratch the enamel. The Japanese scrubber clean out the both pans spotlessly. The Tawashi brush did not lift the seasoning or scratch the enamel on my pans. 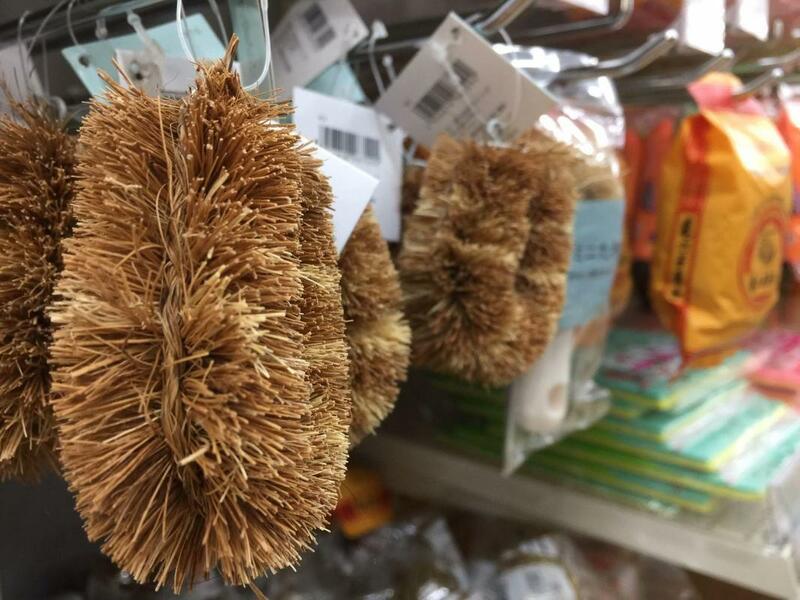 Bristles softened in the water. My first YouTube video. I was so nervous but it was a lot of fun. The really did work well. I was expecting it to lift the seasoning but it didn’t. I even scrubbed rim of the Lodge to really try my best to lift the season but it didn’t. Although I must admit it was only one test and read the instruction before use and I take no responsibility for your pans. The scrubber preformed really well. Much better than what I thought. I also cooked some fried eggs after to see if there were any black spots of seasoning on the eggs. There wasn’t so the the brush did a fine job cleaning my pans. Would I use it? Yes I would to my surprise. For a bit of fun I thought I was going to write a bad review however it exceeded my expectations 10 fold. However like a stainless steel scrubber food particles can get into the bristles so I would try to get as much food out as possible before cleaning. Okay, I brought mine in Japan where it’s a bit cheaper. However check you Asian supermarket they often stock them. Amazon stock a couple of brands and you can check the prices. There’s Black Lion Tawashi which seems a bit cheaper but I haven’t use them. I used the Kame no Tawashi which is the famous one and well respected in Japan. Apparently they last a long time and also the bristles our less likely to fall out. However they are pricier. I hope you enjoyed the article. I’ll try put some more articles on cleaning your cast iron over the coming months however for the meantime please feel free to explore the site. Previous articleGriswold cast iron skillet. Identify, date your skillet using logos. Next articleIs cast iron safe? Here’s what you need to know.